More blogs about Stock Picks Bob's Advice. Bill Rempel, a.k.a. NO DooDahs! A Small Change to my Stock Selection Strategy! Using Ecolab (ECL) as an example! Hello Friends! Thanks so much for stopping by and visiting my blog, Stock Picks Bob's Advice! As always, please remember that I am an amateur investor, so please remember to consult with your professional investment advisers prior to making any investment decisions based on information on this website. For the last several years I have been selecting stocks in the same general fashion. I check the lists of top % gainers first---generally avoiding stocks under $10---a strategy I picked up from the IBD CAN SLIM approach---and screen these stocks further. From there, I usually refer to the Yahoo.com finance page and research the "Key Statistics" on the stock, hoping to find a relatively low p/e, acceptable PEG ratio, and possibly a short ratio over 3.0. (Ecolab's "Key Statistics"). Often I will utilize my Fidelity.com site to check the Price/Sales ratio relative to the company's peers, and the same with the Return on Equity for a look both at valuation and profitability. 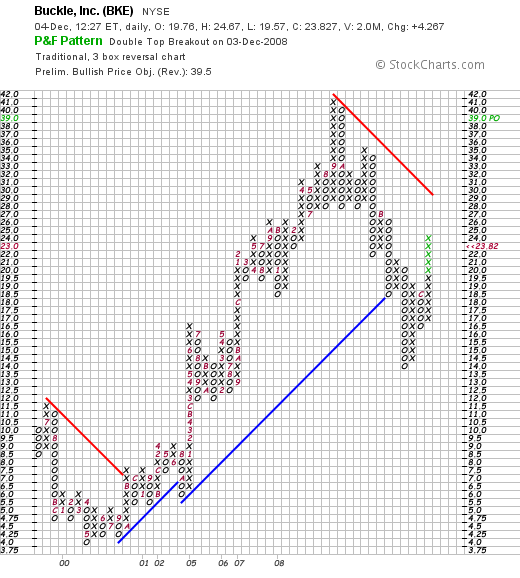 Finally, I like to check the "point & figure" chart from StockCharts.com to see if in my own amateur perspective, the chart looks as encouraging as possible and the stock price isn't instead in some sort of 'free fall.' (Ecolab's "point & figure" chart). My timing of my purchases is still directed by sales of my own holdings as they reach appreciation targets or a sale of one of my minimum of 5 holdings which directs me as well to find a replacement and purchase a new stock. The size of my purchases is now defined by the size of my other holdings. If I am purchasing a stock that is not one of the five minimum, then I purchase shares that amount to 125% of the average value of my other holdings. On the other hand, if this purchase is done 'under duress' that is, made mandatory by my own need to own at least five positions, then that 1-5 position purchase is much smaller, at 50% of the value of the remaining holdings. What I have changed is not my reference to the top % gainers lists, but rather my willingness to not feel bound to that list and to instead purchase a stock that generally otherwise fits my criteria and is a 'high quality' company much like Sysco (SYY), which except for some recent accounting questions raised by Barron's is a great company to own and a company that I recently chose to purchase shares. I use Ecolab (ECL) as another example. It is a similar company to Sysco (SYY), and I suspect they actually compete in the hospital market. However, Ecolab concentrates on cleaning supplies and Sysco has a greater emphasis on restaurant supplies and food. I do not currently own shares in Ecolab (ECL) but I do own shares in Sysco (SYY). Anyhow, I wanted to clarify my slight nuanced change in my stock selection criteria. This blog and my own strategy is absolutely a 'work in progress' and I am glad you chose to come along on this journey. If you have any comments or questions, please feel free to leave them on the blog or email me at bobsadviceforstocks@lycos.com. 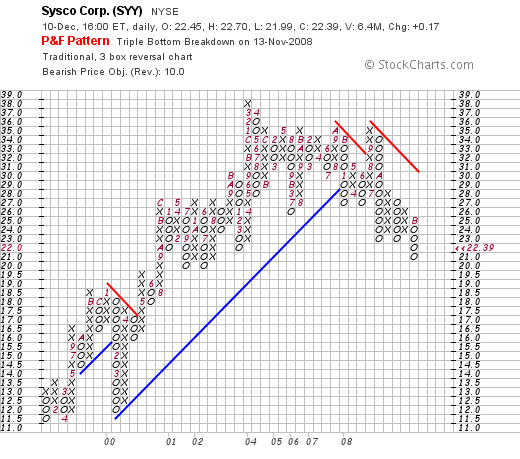 DryShips (DRYS) and Sysco (SYY) "Trading Transparency"
I had a busy, if relatively unprofitable, day today. Yesterday I wrote about my sale of a portion of Johnson Controls (JCI) at a gain, a sale that gave me a 'buy signal' to be adding a new position to my portfolio. Being at 5 positions, I am well under my maximum of 20 holdings, and partial sales at appreciation targets trigger a buy in my investment strategy of responding to the stock market by paying attention to the actions of my own holdings. What I didn't count on was the severe volatility of this market and the fact that picking up stocks on the top % gainers list simply does not lend itself as well to my own strategy as it has in the past. I cannot explain the market activity but to point out that we can see surges in various industry groups as different strategies appear to be employed. One day we observe commodity stocks moving higher, the next day financials, and today we had a lot of energy and commodity-related stocks on the rise. DryShips (DRYS) made the list of top % gainers today and I thought I would try my hand at this stock that has been hit hard recently and has been moving higher along with some of the commodities the past few days. In reality, employing my 8% loss limit on positions 6-20 in my portfolio really precludes me from buying a stock like DRYS which is swinging in 20% price moves the last few days. I learned this today. Nevertheless I purchased 306 shares of DRYS (a number calculated by determining the value of 125% of the average of my remaining 5 holdings) at $11.1856 this morning, only to watch the shares dip and passing my own 8% loss limit within hours of my purchase, I sold these same shares at $10.1522 for a loss of $(1.0334) or (9.24)% since purchase. DRYS did rebound later in the day to close at $10.71, up $1.26 or 13.33% on the day. But I was no longer a shareholder by that time. It is difficult to do so much learning as an amateur in public! But I would like to share with you my experiences so perhaps some of you may avoid my same errors. After a similar experience the other day with Buckle (BKE), I really started asking myself if there was something very wrong with my stock selection approach. Clearly in the current market environment, investors are quick to sell large gains and this activity results in a lack of 'follow-through', something in the past that hadn't been a problem. Momentum has been very fickle. But Johnson Controls (JCI) had worked. So what was the difference? In today's market, the stocks that appear to have some staying power as the market rallies are similar companies of what I would call 'high quality' types with the steady revenue growth and earnings and the like that I write about frequently on this blog. But the over-done spikes in stock prices that are the result of either short-covering or simply market 'fads' for the moment are not the stuff to make an investment today. Instead of sitting completely on my hands as a sale would usually dictate, I instead thought about some of the highest 'quality' companies that have been 'beaten-up' in the market but represent to me companies that may well have terrific longer-term prospects and are simply selling at a steep discount to probably real valuation. O.K. I confess, I believe the market we are in is best served by a touch of 'value investing' in here....more along the lines of GARP investing, where well-known 'quality' growth stocks are selling at discounted levels. Stocks like Fastenal (FAST), General Electric (GE), Walgreen (WAG), Ecolab (ECL), and Sysco (SYY) came to my mind. These are the 'archetypes' of my investment strategy. I chose to pick up some shares of Sysco (SYY), a company I have admired for many years, a company whose trucks dominate the road, providing food for many a restaurant and supplies for hospitals and institutions. This company wasn't going to go away and was selling for a song in the market. At least that was my take today. I wanted something 'safe' after getting my fingers burnt publicly more than once in a short period of time. I needed some sort of foundational stock for my portfolio that would anchor my holdings. I would sell if it hit an 8% loss like any other stock, but I had my doubts of much downside risk at these levels. This afternoon I purchased 154 shares of Sysco (SYY) at $22.668. I was down a few cents on this purchase by the close as SYY closed at $22.39 on the day, up $.17 or .77%. It was a sedate purchase after my violent ride on DRYS. Something I needed I guess :). Let's take a brief look at a few of the things I like about Sysco. You can see from this chart that the stock is now trading at levels not previously seen since about 2002. Technically, there is little evidence that the stock has bottomed or has now turned higher. It looks like there is more on the downside. But some of the valuation numbers suggest otherwise. Looking through some of the headlines on Sysco, we can see that just last month the company raised its dividend by 9%. Not exactly a pessimistic outlook by that move I would say. Also last month, the company reported 1st quarter 2009 results. Revenue climbed 5% to $9.88 billion from $9.41 billion and earnings came in at $276.8 million or $.46/share up from $267 or $.43/share last year. Reviewing the Morningstar.com "5-Yr Restated" financials on Sysco (SYY), we can see a pretty picture of steady revenue growth with the company reporting $26.1 billion in 2003 increasing to $35 billion in 2007 and $37 billion in the trailing twelve months (TTM). Except for a dip in 2006, earnings have steadily increased from $1.37 in 2004 to $1.81/share in 2008 and $1.84/share in the TTM. Dividends have also been increasing steadily from $.50/share in 2004 to $.85/share in 2008 and $.88/share in the TTM. Meanwhile shares outstanding, which were listed at 662 million in 2004 have been steadily reduced each year to 611 million in 2008 and 608 million in the TTM. Free cash flow is postive and growing with $611 million in 2006 and $1.08 billion in 2008 with $1.00 billion reported in the TTM. The balance sheet appears solid with $346 million in cash and $5 billion in other current assets as compared to the $3.4 billion in current liabilities and the $3.4 billion in long-term debt. Finally, in terms of valuation, looking at Yahoo "Key Statistics" we find that the company is a large cap with a market capitalization of $13.46 billion. The trailing p/e is only 12.20, with a forward p/e (fye 28-Jun-10) estimated at 10.46. The PEG works out at a very reasonable level of 0.95. The company pays a dividend of $.88/share with a forward yield of 4%. Finally, the stock last split in December, 2000, when it reported a 2:1 stock split. O.K., I got chicken. I stayed away from the high-fliers and bought something I could really sink my teeth into. Seriously. Something I see when I go out to eat at a restaurant. They are a steady grower, they deserve a spot in most everyone's portfolio from my view. And I have a hard time hanging onto these $10 stocks anyhow that move violently up and down as I am trying to limit my losses in some rationale fashion. DryShips is an outstanding value in here I shall not dispute that fact. But maybe I am getting too old for those kind of stock moves and need something more dependable (?) like a Sysco (SYY). Sort of a 'comfort stock' you could say. Anyhow, that's my update for today. Excuse me for publicly chasing and dumping a stock once again. I am changing my rules for the time being. I shall check but not limit myself to the top % gainers list. It is about time I gave myself a bit of flexibility on this. However, I shall continue to try to manage the stocks that are in my portfolio in the same disciplined (?) fashion. If you have any comments or questions, please feel free to leave them right here or email me at bobsadviceforstocks@lycos.com. Johnson Controls (JCI) "Trading Transparency"
I cannot emphasize enough how my trading is driven by the performance of my underlying holdings. Especially in this time of extreme market volatility, having a plan to deal with price moves, whether they be on the upside or downside, is essential. In my own case, each of my holdings has sale points determined at their time of purchase whether it be a partial sale of 1/7th of my holding as the stock appreciates in price, or a complete sale of the holding should the stock decline 8% (or 16% if in the last 5 of my maximum of 20 positions), or at other set points should the stock have previously appreciated and experienced partial sales of that holding. These sales drive my own responses to the market. On the downside, I either 'sit on my hands' with the proceeds (if I am above 5 positions) or I replace that holding with a new holding of smaller size. In any case, these downside sales drive my portfolio towards cash and away from equities. I am simply trying to "listen" to my stocks as they let me know like that canary in the coal mine whether it is a 'good time' to be investing, or rather a 'bad time' and I should enjoy whatever cash position I can possibly possess. Johnson Controls (JCI) is a rather new position in my minimum of 5 holdings. These holdings have been decreasing in size in a planned fashion. This morning, I sold 13 shares of my 95 share position at $20.36, 1/7th of my holding, as it hit and passed my first appreciation target which is at a 30% gain over an initial purchase. I had just purchased these 95 shares on 11/20/08, not much more than two weeks ago, at a cost basis of $14.83. Thus with the sale at $20.36, this represented a gain of $5.53/share or 37.3%. It turned out to be a timely sale because as the market dipped later in the day, JCI also turned lower and closed at $19.44, down $(.09) on the day. With a sale at an appreciation of a holding, I now have a 'buy signal' to add a new 6th position to my portfolio. I shall be waiting for a suitable stock to come along that meets my own criteria for stock selection and shall keep you posted. Meanwhile, if you have any comments or questions, please feel free to leave them on the blog or email me at bobsadviceforstocks@lycos.com. Just a very quick note to update you on my Buckle (BKE) stock, which I absolutely love, but have learned to part ways as "friends" :). Doug S. dropped me a not earlier warning me about the technicals, but I used my old strategy in a very difficult and unfriendly market that turned around and headed lower today. I sold my 143 shares of BKE which were purchased just hours ago at $24.3968, at $22.0132. That is more than an (8)% loss and being in position 6-20 of my portfolio, it is my loss limit. Anyhow, they are history. It is unfortunate that a 'favorite' of mine should disappoint like that. But I remain committed to limiting losses, exercising trading discipline, and recognizing trading mistakes as soon as possible. I also am committed to sharing with you my own actual trades as foolish as they may sometimes appear. Please feel free to comment here or email me at bobsadviceforstocks@lycos.com if you have any other thoughts. I needn't tell you that the 'nickel in my pocket' from my partial sale of WMS (WMS) yesterday was burning a big hole and waiting to be spent! If you didn't catch the story about Ford (F) yesterday, I would encourage you to take note of anything that sounds optimistic about the economy. Yesterday Ford (F) related that it was increasing production of the F-150 pickup. "Analysts said a sharp drop in gas prices curbed the decline in truck sales. Ford already announced in October that it planned to restore in January a third shift at its other F-150 plant in Dearborn, Mich. Those roughly 1,000 workers had been laid off earlier this year as the automaker cut production. The decision to shift workers at the plant in Claycomo near Kansas City to F-150s is continuing that strategy, Kozleski said. "Despite the challenges in the market, the fullsize pickup remains one of the big sellers in the industry and we are ensuring we have capacity to meet market demand," she said." Now this particular entry in my blog isn't about Ford (F) at all. We all know the CEO's of the 'big 3' automakers are back testifying to Congress over their need for federal subsidies to keep them in business. But isn't it somehow reassuring that some part of the auto business, even if it is the F-150 pickup line, is showing some life and growth in the midst of what sounds to be universal despair? Anyhow, I had that nickel in my pocket this morning. If you aren't a regular reader of my blog, I should explain that my stock portfolio shifts between 5 and 20 positions. I use the performance of my own stocks to determine whether I should be adding a new position or shifting more funds into cash. With a sale of 1/7th of my WMS position at a 30% gain (my first targeted appreciation level), that action generated a 'buy signal' for me and I was on the 'lookout' this morning for a good prospect to add to my portfolio. Checking first with my favorite starting point, the list of top % gainers, I found that an old favorite of mine, Buckle (BKE) had made the list and currently as I write is trading at $23.85, up $4.29 or 21.93% on the day. I went ahead an purchased 143 shares of Buckle (BKE) at $24.3968. I calculated this number of shares by purchasing 125% of the average of my other 5 holdings---as I have written about as my plan for the positions 6-20 in my portfolio---positions that are purchased on 'good news' events. I say 'old favorite' of mine, because I first wrote up Buckle (BKE) on this blog on April 8, 2005, and then 'revisited' the stock again on December 23, 2006. What drove the stock higher today was the announcement before the open of November sales for the four-week period ended November 29, 2008. Unless you are living in a cave, you probably are quite aware of the retail sales slump that we are experiencing in the United States, and the global economic slump the world is working through. Anyhow, the Buckle reported that November sales overall increased 21.6% to $72.2 million from $59.4 million last year. Pretty solid! But even better was the same-store numbers which Buckle reported that for stores open at least one year, same-store sales during the period climbed 15.0%. Year-to-date, comparable store sales for the 43-week period ended November 29, 2008, increased 22.6% over the same period the prior year. So while the growth wasn't quite at the pace of the prior 6 months, it is still pretty amazing! In addition, the company in the same announcement reported that it was busy rebuying its own shares, acquiring 391,400 shares of stock at an average price of $16.23/share. If we look at the StockChart 'point & figure' chart on Buckle (BKE), we can see that the stock peaked at $42/share back in September, 2008, and dipped to as low as $14 this past November, 2008. The stock is moving higher from that intermediate low point, breaking above prior 'support lines' (the blue line on the graph) at $18.50, and pushing towards resistance at $29. Reviewing the Morningstar.com "5-Yr Restated" financials on Buckle (BKE), the growth in revenue, earnings, and free cash flow is unabated. The company is paying an increasing dividend and at the same time reducing its outstanding shares. The balance sheet is solid with a current ratio of almost 4. There is nothing not to like on this page. In fact, if we check the latest quarterly report, the 3rd quarter results were reported just two weeks ago: earnings came in at $.62/share or $.64/share removing a one-time charge. This was $.01 ahead of estimates! Net sales came in at $210.6 million, up from $167.6 million last year. And same-store sales for the quarter came in up 19.1% (!) from last year. Nothing shabby there. In fact, I am a bit perplexed how this company has managed to escape the retail struggles of the other stores at the mall! Looking at Yahoo "Key Statistics" for a brief update on some valuation numbers, the company has a market cap of $1.1 billion, making it a mid cap stock with a trailing p/e of 11.19. With a forward p/e of only 10.75, the company has a PEG ratio of 0.60 practically screaming to me of great value! As I noted earlier, the company pays a great dividend of $.80/share yielding 4.60%. The payout ratio is only 33% giving it ample room to increase it in the future depending of course on future earnings and prospects. In fact, the company just completed a 3:2 stock split on October 31, 2008. Anyhow, that's the news on my trading portfolio. I do not know if I am seeing the light at the end of the tunnel, but somehow that F-150 report yesterday got me a bit encouraged. And it is nice to see an 'old name' of mine moving higher on good earnings and sales news. Sort of like old times. Thanks again for stopping by and visiting. If you have any comments or questions, please feel free to leave them on the blog or email me at bobsadviceforstocks@lycos.com. WMS Industries (WMS) "Trading Transparency"
Late this afternoon, my shares of WMS Industries (WMS) reached the first targeted sale point with a 30% appreciation over my initial purchase. Only owning 83 shares (a reduced size position due to my recent strategy of replacing stocks in the minimum of 5 positions with smaller purchases), I sold 1/7th of my holding or 11 shares at $26.21. I had purchased my 83 shares just a month ago on 10/28/08 at a cost basis of $20.12. Thus, I had a gain of $6.09 or 30.3% since purchase. My portfolio management strategy is to respond to sales of holdings within my account with specified actions. In this case, holding 5 positions, well under my maximum of 20, a sale at reaching an appreciation target generates a buy signal. That is, I now have a proverbial 'permission slip' to be adding a new holding to the account. Certainly, I need to review potential purchases to make sure they meet my own criteria for inclusion in my portfolio, but it is exciting to once more get some sort of positive signal about the market from my own portfolio! In terms of sizing the new position, since I shall be adding a new holding on 'good news', and not just because one of my minimum of 5 holdings needed to be replaced, my size for the new position will be 125% of the average of the other 5 holdings currently. When the opportunity arises to purchase that holding, I shall be getting my calculator out and determining the number of shares to purchase. I hope all of this strategizing out loud helps all of you in thinking about how you manage your own accounts. I know it helps me. If you have any questions or comments, please feel free to leave them on the blog or email me at bobsadviceforstocks@lycos.com. Click HERE for my latest podcast on WMS Industries (WMS), I read a poem "Filling Station" by Elizabeth Bishop, and discuss some of the recent changes I have made in my investment strategy due to my experience in this most severe of Bear Markets! Please email me at bobsadviceforstocks@lycos.com if you have any comments or questions regarding this or any other podcasts or comments I have written! A Reader Writes: "Maybe stock selection is worthless." and a closer look at my Trading Portfolio! My loyal reader and commenter, Doug S. gave me a prod this weekend about writing a bit more on the blog. He is finding it difficult to get very excited about any particular stocks and is finding the entire market rather discouraging. "You have been very quiet both publicly and privately recently. Any thoughts where the general market may be heading short term? Individual stock selection has been a waste of time(and money) for the last few months." Doug, you are right on the mark with this letter. I have indeed been a bit 'quiet' and share your own sense of discouragement at the relentless correction and bear market we have been experiencing. So many 'right' stocks have been acting simply 'wrong'! We can see that the Dow peaked at about 14,150 in October, 2007, and hit a recent low this month (November, 2008) at about 7,450. The stock market is currently rebounding and closed at 8829 on November 28, 2008. The chart is, however, far from encouraging. The trend appears to continue to be lower--with lower lows and lower highs. At least technically, I don't see anything that appears to be very promising. Sorry to be so gloomy. But I can see what everyone else is looking at as well. So what is an investor to do? But I do not believe that picking stocks is now obsolete. It is just that the over-riding influence on all of our investments has been the "M" in CAN SLIM. My approach to investing has always been that I would try to maximize my own investments by picking what I thought were the 'best' stocks to own and yet being quite aware of the possible effects of both a climbing 'bull' market as well as the ravaging effects of a 'bear' market! In fact, my own approach which reduces my holdings down to a minimum of 5 (out of a maximum of 20) positions was not even adequate to deal with the tremendous correction we are facing. Thus, I recently reduced my 'replacement' positions in the bottom 5 to 1/2 of the average of the remaining holdings. In addition, in light of the record volatility of the market with hundreds of points in both directions in the same day becoming the norm, I have expanded my exposure to loss in any individual holding to 16% from 8% in my bottom 5 holdings only. So I share your frustration. But I believe that we are closer to the bottom than the top and that the market will actually start moving higher before the recession is over, moving in anticipation of the actual economic recovery. I have always pointed out that I am not able to call a bottom, a top, or anything in between. However, as an observer of the market, I can respond to the actions of my own portfolio that I hope will continue to generate 'signals' to let me know whether I need to continue to pull back from equities or whether it is time to shift some of my cash position into new holdings. As part of my own effort to respond to the market when it does turn positive, I have changed my own arbitrary sizing rule for positions to the 125% of the average of my holdings on purchases above my minimum of five holdings, and have, as I have indicated, reduced the position sizes to 50% of the average holding on replacement purchases to maintain my five position exposure minimum. I hope that these strategies will help me respond to market opportunities yet continue to allow me to protect my account value in the face of a savage bear market. Speaking of my holdings, let me use this opportunity to briefly review my five holdings. This list will show the names of the stocks, their symbols (in alphabetical order of their trading symbols), the number of shares held, date of purchase, the cost basis, latest price (11/28/08), and the % gain or (loss). In terms of my overall portfolio, I currently have $21,903.32 in a Money Market account, and $14,470.35 in equities as described above. As of 11/28/08, I have $2,044.86 in unrealized gains in my trading account and this year, I have a net gain of $609.10, resulting from net short-term losses of $(8,679.66) and net long-term gains of $9,288.76. The total account value is $36,374.27. I am currently adding $200.00/month in new cash into the account each month. My entire strategy is a very tedious business. When the market turns around, I am likely be slow in re-entering, but I shall commit new funds in a methodical fashion as my own stocks indicate. 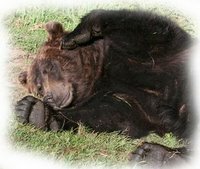 In the same fashion, if the bear market continues, I shall strive to protect my account with the same conservative stock management that has served me well thus far. I am not sure if I adequately answered your question and comments Doug, but I came out of my slumber for a short while to write. Now, back to that cave and some more sleep. Will someone please wake me when it is all over :). If you have any comments or questions, please feel free to leave them right here on the blog or email me at bobsadviceforstocks@lycos.com. Esco Technologies (ESE), PetSmart (PETM), and Johnson Controls (JCI) "Trading Transparency"
The market is acting in what is for me an unprecedented fashion. How do you explain a stock market that drops another 444.99 points today to 7,552 on the Dow, or another 70.30 points on the Nasdaq to 1,316? I guess you don't. Needless to say that "M" in CAN SLIM, as William O'Neil would say is determining the performance of all of my holdings. And I was disappointed today that I needed to sell my 47 shares of Esco (ESE) at $27.27. These shares were purchased literally just days ago at $32.73, so in this short period of time I incurred a loss of $(5.46) or (16.7)% since purchase. Since this position is one of my final five positions, as I have pointed out elsewhere, I have tried to tolerate the greater volatility in the market with (16)% loss limits (instead of my usual 8% loss limit). Even so, within days this stock managed to dip that 16% and I sold my shares this morning. The market deteriorated into the final hour (as it has been tending to do on a regular basis), and ESE closed at $25.97, down $(2.18) or (7.74)% on the day. This is in no way a reflection on the underlying fundamentals of this stock, as far as I can tell, but rather on the underlying fundamentals of the entire market. Esco had great quarterly results reported just days ago, and as I wrote in my earlier post, a very nice Morningstar.com '5-Yr Restated' financials page. But the powerful downward plunge of this market is 'lowering all ships' and Esco (ESE) is no exception. I sold my shares and paradoxically, since I was then down to 3 positions, this generated a buy signal giving me the opportunity to purchase two positions, albeit reduced in size, to bring me back to my minimum of 5. With the market behaving relatively benignly earlier in the day with talk of a automotive manufacturer's bail-out discussed, I waded back into the water, purchasing two small positions: 104 shares of PetSmart (PETM) which announced good earnings, at $15.50/share, and thinking that the entire automotive industry might yet be 'saved', I thought it might be a good time to venture back into my 'old favorite' Johnson Controls (JCI) and purchased 95 shares at $14.75. PETM gave up much of its earlier gain before the close, itself being caught in the downdraft, and closed at $14.84, up $1.52 or 11.41% on the day. JCI closed down a little less from my own purchase at $14.14, up only $.07/share on the day or 0.50%. I am back to my minimum of 5 positions. But with each of these purchases, I continue to shrink the size of my holdings, and shift a little more each time over to cash. Currently my 5 positions add up to about $11,000 in value, and my cash position in my ever-shrinking portfolio is at $22,000. And to think that just months ago I was listening to my son tell me I needed to get out of margin. My portfolio management strategy is working, albeit in fits and starts, to shift me into cash while allowing me to continue to have equity holdings to direct my own future sales and purchases! Thanks again for visiting! If you have any comments or questions, please feel free to leave them on the blog or email me at bobsadviceforstocks@lycos.com. What is an individual investor to do? Is the market closer to the bottom or the top? Is it too late to sell or should one move to cash? Is it time to 'bottom-fish'? Are we on the verge of a Great Depression 2 or is 2009 to find us with indices pushing towards new highs? I will be the first to tell you I don't know the answers to the above questions. I am not sure anyone really knows. But I do believe that each of us has the power to implement disciplined approaches to our own portfolios that may assist us to avoid excessive exposure to equities when times are bad and help us to know when to be adding to equities when the market firms up and improves profit possibilities for investors. What I have been doing isn't very complex. I have been using the actions of my own holdings to direct me to either be adding to stocks or moving from stocks into cash. It is that simple. I am not sure this is a profitable approach; certainly there must be better ways to go about all of this. I just know that I find it helpful. Without discussing the which stocks I buy which I have written about elsewhere and shall certainly write up again, let me simply suggest that from my approach I am trying to own only the highest 'quality' stocks on the market. We each may define quality differently, but there may be reasons why managing our holdings in response to market actions may be wise. My approach is based on the belief that market actions may be interpreted through the price changes within our own portfolios of holdings. Like a barometer responding to atmospheric pressure, my own portfolio is built to drift between 5 and 20 positions depending on the market's effects on my own holdings. Assuming that a maximum of 20 positions is utilized, I believe that 10 positions would be a neutral posture, 5 is most conservative, and 20 is most aggressive. Once I have my holdings I either add positions (assuming I am under 20 positions), or sit on my hands with the proceeds---moving to cash (assuming I have at least 5 positions)---based on targeted moves higher or lower of my individual stock holdings. These permission slips or directives to avoid reinvesting proceeds are the indicators I use to posture my own holdings. It is that simple. I have set appreciation targets for partial sales at 30, 60, 90, 120, 180, 240, 300, 360, 450%...etc., at which point I sell 1/7th of my remaining shares of that holding. These sales are considered sales on 'good news' and they generate the signal to add a new position (unless at 20 in which case I do the opposite---sit on my hands). On the other hand, sales on declines are used as indicators of sickness of the overall market environment as evaluated through the eyes of my own holdings. Targeted sale points are either at an (8)% loss (if I own 6-20 positions) or (16)% losses (if I own 5 or less positions). I have increased my loss limit for my last 5 positions to reduce my own trading velocity in a declining and highly volatile market. In addition, after a first sale of 1/7th of a holding at a 30% gain, I sell all of my shares if the stock should decline to break-even, or sell my entire position if a stock has reached two or more appreciation targets (60% or higher), I move my sale point up to 1/2 of the highest % sale. In other words, if I happened to sell a stock 3 times (1/7th of holdings each time) at 30, 60, and 90% holdings, I would move my sasle point up to 1/2 of 90% or at a 45% appreciation target for ALL remaining shares. These 'bad news' sales generate a directive to NOT reinvest funds and instead to 'sit on my hands' unless I am at 5 or less positions. In those particular cases, which I currently find myself in, these sales paradoxically do generate a buy signal to get me back up to my minimum of 5 holdings. However, in my continued recognition of the need to shift from equities to cash in these situations, I have recently modified the purchase to a smaller holding--representing 1/2 of the average size of the remaining positions. In fact, I have recently also been doing some more thinking on position size. As above, when buying to replace one of the last 5 holdings, I buy enough shares for 1/2 of the average size of the remaining positions. However, as the market presumably improves its tone and I wish to start once again increasing my exposure to equities, for positions 6 through 20, I plan on adding 125% of the size of the remaining positions. These sales and movement into cash and back again, and these position sizing allows me the opportunity to automatically respond to market actions in some sort of rational fashion. I hope that the current currection is short-lived, although I have my doubts about that. In any case, I am positioning my portfolio to continue to have exposure to equities but to work hard at listening to my own portfolio as my own holdings let me know how to deal with the overall market. Thanks so much for bearing with me. I wanted once again to lay out my strategy in some detail. If you have any comments or questions, please feel free to leave them on the blog or email me at bobsadviceforstocks@lycos.com.